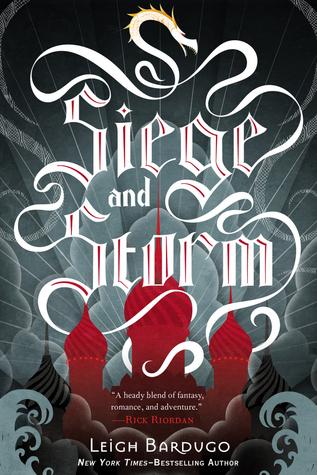 Book Buddies Review: Siege and Storm by: Leigh Bardugo | Next Page Please! Lauren: My first note in my reading journal was that it got right into the action. I don’t honestly remember how it first started, but I’ll take my past-self’s word for it. 😉 Looking back though, I think it took me longer to get into because it’s such a different world, especially when the characters are travelling around so much. I kept having to reference the map and figure out where everything was. In general, it’s definitely easy to get caught up in the world because of the writing and I did pick up where we left off. I feel like I’m giving very 50/50 answers right now, even though I did REALLY enjoy the book!! I always forget how it can be funny at times too. I like Alina’s sense of humor and her conversations with Mal can make me laugh sometimes. Kaitlin: One thing I love about characters that have been best friends with each other is that they aren’t afraid to be funny around the other person. That’s something I really liked with Mal and Alina and they were pretty funny at one point! Also I always referenced the map too! Things just got kind of confusing so the map was my place to go. Q: How did you feel about the mix of action vs. world-building? Lauren: As I said before, it was still more world-building than action. Most of the crazy fighting and interesting things happened at the end. I think the book was definitely well-paced and I kept wondering what was going to happen next. I mentioned that my first note in my reading journal was that it got right into the action…but my last note in the journal says “slow-moving.” Haha! Apparently the action changed throughout the book. I think that kind of makes sense though. The book starts kind of where it left off and jumps right into action, then plateaus as they travel around the country and try to figure everything out. Towards the end it picked up again, with all the fighting and such, but then it tapered off at the very end. I really love the world-building though. Her writing is totally engrossing and interesting; she made the COOLEST world. There were constantly new things being introduced, like Morozova’s amplifiers. I will say though that some parts of this book REALLY reminded me of Harry Potter. First of all, there were three amplifiers (the stag, firebird, and sea whip) – very similar to the Deathly Hallows, where if you have all three you defeat death. In this case, she gains the most power possible by having all three. AND, when the Darkling’s creature gave her a scar on her shoulder, she’d start feeling a pain there whenever he was near…exactly like Harry and Voldemort! Kaitlin: I have never really thought of this book being similar to Harry Potter but I have to agree with you on that one, there are aspects that are similar. Oh my gosh! If Nikolai lives then it will be the new Harry, Ron, and Hermione but this time with Mal, Nikolai, and Alina! Q:What did you think about the new character, Strumhond? Kaitlin: I also loved him so much (the the point where I was shipping myself with him…oops) and he is such a funny character. He is the person that everyone likes and is very social. He is so brave and just adventurous. Ugh! I just love him as a character and is a great addition to the book! Q: How did you feel about the character development within Alina? Lauren: OH MAN. I thought it was so cool that she slowly came into her powers and learned how to control them during the first book, and that dynamic just intensified so much during this book. It kind of scared me a little book, to be honest. I kept thinking she was going to turn into a villain or something! The Darkling was right when he said the two of them had more in common than she thought. Her character development directly impacted Mal, too, as the Darkling predicted. Their relationship slowly became more strained as she gained more power, because he felt that he didn’t really have a place in her life aside from being a bodyguard. Regardless, it was interesting to see Alina’s powers grow and she started reacting to things with much more confidence than she did in the previous book. I can’t even imagine what’s going to happen when she gets the third amplifier. Kaitlin: One thing that really scared me was how right the Darkling was about Mal. At first I thought “Psht, Mal will stay by Alina no matter what,” but now he is so correct about the situation. It hurts thought. I love Malina so much and to see them so scared…IT HURTS LAUREN IT HURTS. Back to the topic, the development in Alina’s powers were also very enjoyable to read about. I really hope we get to see epic Sun Summoner power in the next book. Thanks for reading and we’ll see you again in March for Ruin and Rising! Make sure to check out Lauren’s blog for the rest of the discussion!